School Midsummer ball raises funds for Campden area home nursing. 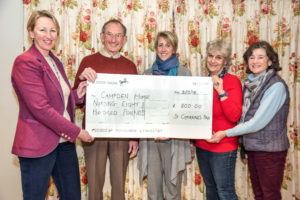 St Catharine’s PAG chair Gill Theo presents a cheque to the committee of Campden Home Nursing for £800 raised at the Campden Midsummer Night’s Ball event earlier in the year. Pictured left to right: Gill Theo, Mike Sporton, Rebecca Zamir, Sarah Hudson-Evans, Marion Houghton.